Will a temple be rebuilt in Jerusalem? The book of Revelation gives us strong evidence that it will. Jerusalem is arguably the most religiously and politically volatile place on earth. The mere mention of building a Jewish temple where the Muslim Dome of the Rock and Al Aksa Mosque are located creates a worldwide stir. But the Bible tells us that not only will the Temple be rebuilt in Jerusalem during the Tribulation but a Millennial Temple will be built to replace the Tribulation Temple. The word “temple” is found 355 times in the Bible. The phrase “temple of God” is found 9 times, once in the Old Testament where it is used to refer to the Tabernacle at Shiloh (2 Chronicles 23:9) and eight times in the New Testament. In the New Testament it is used to refer to Solomon’s Temple and Herod’s refurbished temple (e.g. Matthew 21:12). Born again Christians are referred to as the “temple of God” because the Holy Spirit resides within them (1 Cor. 3:16; 17; 2 Cor. 6:16 and 19). Lastly, the phrase “temple of God” is used to describe the temple of the Tribulation (Rev. 11:1 and 19) in which the Antichrist will proclaim himself to be “God” (2 Thess. 2:4). Jesus is “the BRANCH.” The temple He will build is the Millennial Temple. It is necessary for another temple to be built because the Tribulation temple will have been defiled by Antichrist. This temple is described in great detail by the prophet Ezekiel (Ezekiel 40-48). Messiah Jesus will rule from this temple during the Millennium (Revelation 20). This will be a Holy Temple. The temple built during the Tribulation on the other hand, is built by man and will be defiled by man. So, there’s going to be two more temples? Confused? Maybe we should look a bit at the history of the temples of God. The first temple was built by Solomon around 1050 B.C. (2 Chronicles 3-4). It took him 7 years to build (1 Kings 6:38). It was constructed in reverence (1 Kings 6:7). It was built 480 years after the Exodus (1 Kings 6:1, 37-38). This temple held the Ark of the Covenant (1 Kings 8:1-9). But because of the spiritual idolatry of Israel God allowed the Temple to be plundered and burned by the Babylonians around 586 B.C. (2 Kings 25:9-17). After 70 years of captivity a second temple was built. God through the Persian king Cyrus allowed His people to return and rebuild the Temple under the leadership of Joshua and Zerubbabel (Ezra 1:1-4; see Jeremiah 25). 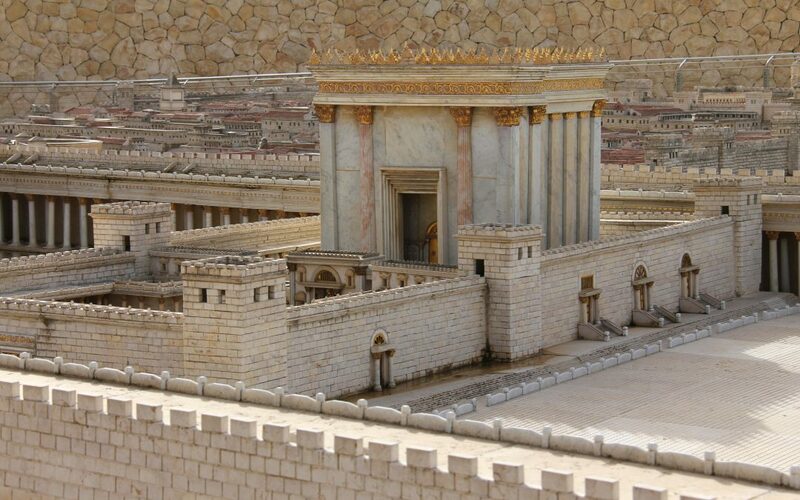 The glory of this second Temple was nothing compared to the glory of Solomon’s Temple (Ezra 3:12). The books of Ezra, Nehemiah, Haggai and Malachi discuss the rebuilding of the temple of God and some of the problems faced in the process. In 20 B.C. king Herod, in an effort to find favor with the Jews, ordered a temple renovation that restored much of its past glory. This renovation was so extensive that it is sometimes referred to as the third temple. In A.D. 70 the Roman Titus rode into Jerusalem and put down a rebellion of the Jews. Titus ordered the Temple be left alone. But a drunken Roman soldier threw a torch into the Temple setting it ablaze. The fire melted the gold in the Temple. The Roman soldiers ripped every stone apart to get at the gold and thus destroying the Temple. This fulfilled Jesus prophecy made 30 years earlier (Matthew 24:1-2). From that point Jews were dispersed throughout the world and persecuted severely for nearly 1900 years. On May 14, 1948 they miraculously returned to their homeland and were reestablished as the nation of Israel. This was an incredible fulfillment of prophecy (Ezekiel 36-37). It wasn’t until the 1967 war that Israel gained control of Jerusalem. Inexplicably general Moshe Dian allowed the Muslim caliph to remain in control of the Temple mount. If this hadn’t happened the Jews might have rebuilt the Temple, then and there. But God had another plan. It will take unprecedented political ability and charisma to work out an agreement that will allow the Jews to rebuild their Temple. Who could broker such a deal? We don’t know when the Antichrist will come to power (Daniel 9:26-27). But when he does Daniel tells us Antichrist makes or will “confirm” an existing covenant (Daniel 9:27) for a 7-year period with Israel. He will break that covenant at the midway point (Daniel 12:11). This covenant will allow for the Temple to be rebuilt and sacrifices reinstated. But “on the wing of abominations shall be one who makes desolate,” in other words the Antichrist will not only betray his covenant with Israel but will desecrate their Temple (Matthew 25:15-16). Indeed, what Jesus referred to from the book of Daniel as “the abomination of desolation” (Matthew 24:15) will occur when, “. . . the son of perdition, who opposes and exalts himself above all that is called God or that is worshipped, so that he sits as God in the temple of God, showing himself that he is God” (2 Thessalonians 2:3-4). In order for all this to happen a fourth Temple will have to be built in Jerusalem. Today in Jerusalem Jewish yeshivas (priestly schools) train students to be temple priests. The Menorah to be used in the Temple along with all the other utensils have been made. In Israel there is a Temple Institute devoted to preparing for the rebuilding of the Temple. There is a group called The Temple Mount Faithful committed to rebuilding the Temple. People are ready now to rebuild the Temple. On May 14th, 2018 Israel celebrated their 70th birthday. The United states, under the direction of President Donald J. Trump, affirmed Israel’s existence by not only recognizing Jerusalem as the Capitol of Israel, but formally moving its embassy to Jerusalem. This is important because is solidified Israel’s place in Jerusalem and moves them one step closer to being in position to rebuild their Temple. The Temple Mount today is a 35-acre flat platform. It has only become one of Islam’s most holy sites since the 1967 war. In the late 600s A.D. a man named Omar built a mosque referred to now as The Dome of the Rock. Muslims believe the rock around which this mosque is built is where Muhammad on his magical horse ascended to heaven. How could a Temple be built on this site? The mosque might be removed, (an earthquake or terrorist attack?). It is certain that any terrorist attack on the Dome of the Rock would lead to a jihad bloodbath of Biblical proportions. There is another possibility. The first two verses of Revelation 11 give us important evidence about the next Temple. It states, “Then I was given a reed like a measuring rod. And the angel stood, saying, ‘Rise and measure the temple of God, the altar, and those who worship there. But leave out the court which is outside the temple, and do not measure it, for it has been given to the Gentiles. And they will tread the holy city underfoot for forty-two months.” Why would the outer court not be measured? This would significantly reduce the space needed for the Temple to be rebuilt. And it just might make room for Gentile structures to coexist in close proximity to the Holy Temple of God. In the March/April 1983 issue of The Biblical Archeological Review Dr. Asher Kaufman reported on his 16-year study of the Temple Mount. He theorized the Dome of the Spirit, (a gazebo like structure in the northwest corner of the Temple Mount platform) was the spot where the Holy of Holies of the Temple had been located. This could have great implications. Remember the instruction of Revelation 11:2, “But leave out the court which is outside the temple, and do not measure it, for it has been given to the Gentiles. . ..” Given the positioning of the Temple with the Holy of Holies placed at the point of the Dome of the Spirit, the Temple inner court area would fit on the Temple Mount at this moment! The outer court area apportioned to the gentiles may be for the Muslims and their mosque. If this is true, the Temple could be rebuilt right now! All that remains is for a persuasive and cunning politician, (like Antichrist) to negotiate a treaty between the Jews and Muslims to allow for this. In Daniel chapter 9 we are told of one who will arise and be “cut off.” This is Messiah Jesus. He was cut off “not for Himself” but for us on the cross. The Antichrist is the “prince who is to come.” The antichrist will oppose Christ and all He stands for but will do so in a deceptive way. The Antichrist will present himself as an alternative to Christianity. He will say something like, “Religions in general have been too intolerant and the root cause of wars and rumors of wars throughout history. Christianity in particular has been too intolerant of other religions. I’m here to present you with a new religion of tolerance.” He will preach tolerance. He will encourage religions to peacefully coexist side by side. What better example of this than to have two historically intense religious arch rivals like Islam and Judaism set up their holy sites side by side on arguably the holiest site on earth? But even if such a scenario seems too outlandish to you there’s another more recent option. In 2014 with the publishing of the book Temple – Amazing New Discoveries that Change Everything About the Location of Solomon’s Temple (Life Bridge Books, Charlotte North Carolina) by author and archeologist Robert Cornuke, still another possibility for rebuilding the Temple was postulated. It is Cornuke’s belief that what we think is the “Temple Mount” of today was really where the Romans legion of Jerusalem was garrisoned and not the Temple Mount. He believes the real “Temple Mount” was to the south in the City of David which is under excavation right now. Cornuke’s theory has been met with a lot of opposition by those holding to the more traditional view. It’s still an interesting and thought-provoking hypothesis. Something for us to prayerfully and prophetically consider. The jury is still out. But if Cornuke’s claims are true, the next Temple could be erected as soon as contractors could be commissioned paid to do the job! The modern day Nascent Sanhedrin in Israel is pushing for the rebuilding of the Temple. In a number of recent articles from Breaking Israel News the closeness of the Temple’s rebuilding has been reported. On August 29th, 2016 it was reported that the Nascent Sanhedrin in Israel had appointed a high priest in readying for the rebuilding of the Temple. On November 20th 2016 in an article entitled Sanhedrin Asks Putin and Trump to Build Third Temple in Jerusalem  reported that the Sanhedrin and others actually encouraged these world leaders to help them rebuild the Temple. President Trump is seen as a modern-day Cyrus. An article on March 19th, 2018 entitled Sanhedrin Calls on Arabs to Take Their Role in Third Temple as Prophesied by Isaiah wrote that the Sanhedrin are reported to have called on their cousins the Arabs to unite with them and build the Temple as a sign to the world of peace. And lastly, in an article in ChristianHeadlines.Com dated May 30th, 2018, and entitled Plans Underway for Construction of the Third Temple it states: “Rabbi Richman, director of the International Department of The Temple Institute, says he is committed to rebuilding Jerusalem’s Temple Mount.” The fervor of these articles and the evidence that the rebuilding of the Temple is definitely on the minds of many Israelis show us that we are closer than ever before to the rebuilding of the Temple. You can smell it in the air. No matter where the Temple placement is, what we need to see is that the mere consideration of such a rebuild of the Temple is evidence we are in the End Times. Before the Antichrist is revealed and Temple rebuilt, the Rapture of the Church will occur. We shouldn’t be reduced to looking for Antichrist. Instead we should be looking for the return of Jesus Christ! Jesus is coming to take genuine born-again believers out of this world before the wrath of God is poured out on a Christ rejecting world (1 Thessalonians 4:13 – 5:11; Revelation 3:10). God’s promise is that Jesus “delivers us from the wrath to come” (1 Thessalonians 1:10). Scripture clearly states that “God did not appoint us to wrath, but to obtain salvation through our Lord Jesus Christ” (1 Thessalonians 5:9). Since the time of the Tribulation (described in Revelation 6-18) is a time of God’s and the Lamb’s outpoured wrath (cf. Revelation 6:16-17; 11:18; 14:10, 19; 15:1, 7; 16:1), it would not be just for those “saved from wrath through Him” (Romans 5:9) to go through the Tribulation period. This was prefigured in the Old Testament account of the removal of Lot from Sodom and Gomorrah (Genesis 18:16-33). And it is seen in the context of the New Testament. Logically, when we consider scripture as a whole, inductively, it leads us to the expectation of being removed out of this world via the Rapture of Christians by Jesus before the Tribulation. Are you ready? Look around you, see the signs. The time is at hand. You don’t want to be left behind to experience the Tribulation. Make your salvation sure (1 John 5:13). Turn from your sins and trust Jesus as your Savior (Acts 3:19; Romans 6:23; 1 John 1:9). If you see the Temple being rebuilt, it’s likely too late for you to escape, you’ve probably already been left behind. But at least you know what to expect. God has provided an entire Book of Revelation to help you through. And though times will be hard and scary, the Lord will help you through. “And they overcame him [the devil] by the blood of the Lamb and by the word of their testimony, and they did not love their lives to the death” (Revelation 12:11).